Organize your home with three sizes of nesting baskets. 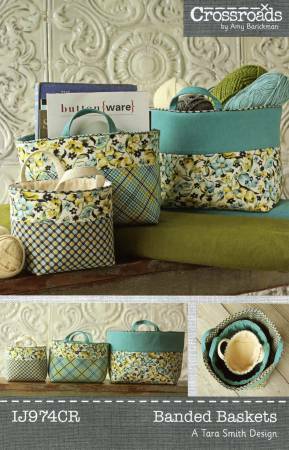 Create by combining 2 to 4 fabric coordinates in your favourite colors. Short, double handles make moving easy while the durable construction makes them perfect for holding yarn, magazines or sewing supplies. Piping along the top edge adds the finishing touch. Sizes: Small: 5in wide x 6in long x 6in high; Medium: 7-½in wide x 9in long x 8in high; Large: 10in wide x 12in long x 11in high.